The DinoFamily loves fish, steamed or fried, besides cod fish our 2nd favourite is Salmon. Salmon; btw is pronounced without the "L" sound or listen to the pronunciation here, is rich with the amazing omega-3 and vitamins, it tastes good raw or cooked too. There are many types of salmon and reading online, it is advised to get Pacific salmon which are mostly wild thus safer to consume. To know how to differentiate between farmed and wild salmon, the harm for eating farmed salmon, click here to read about it. You can Google more about salmon if you are interested, I am not doing that now. So anyway, I have requests to do more steam dishes so I thought I'd start with one of our favourite fish. Couple of months ago I bought a full salmon, first time ever! Its a Norwegian Fresh Water salmon from Giant and it cost me less than $20 **Updated 06 Jan 2016 - The whole salmon cost me a whooping $38+, I dug out my piles of receipts and scoured through them till I found it. ** That morning I simply grabbed 2 salmon fillet from the freezer (I really have to start labeling those freezer bags!) only to realized later that evening that I have took out parts that are near the belly. Luckily the fish is quite thick so there is enough meat to go around, plus I think DinoPapa will prefer the belly to meat. This dish is so simple to prepare and cook, great for days when you are pressed for time. Simply just sliced up the ginger and scallion (which I don't have it at that time), wedge and juice the lemon, dump every thing onto the salmon fillets, steam it for 8-10mins. 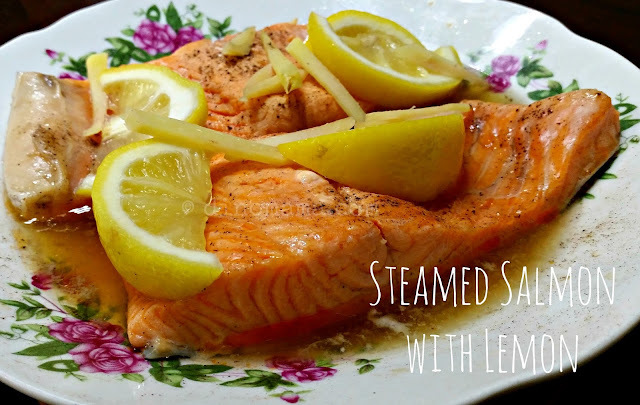 The lemon makes this dish very appetizing thus it goes well alone with either steaming white rice or pasta. We had ours with tomato rice and soup that day, I was feeling under the weather but boy did I ate alot! It was satisfying and the pig's stomach soup from MIL is an awesome comfort food. I felt so much better after that meal. I hope you enjoy this dish as much as we do, let us know your verdict about this after you cooked and tasted it. 1. Thoroughly rinse the fish in cold water and pat dry. 2. Put the fillets in a 9-inch shallow heatproof bowl. 3. Drizzle the soy sauce, salt and pepper over the salmon. 4. Sprinkle with the scallions and ginger. 5. Cut the lemon in half crosswise. Cut half a lemon into 4 slices and put on the fish. Juice the remaining lemon and drizzle over the fish. 6. 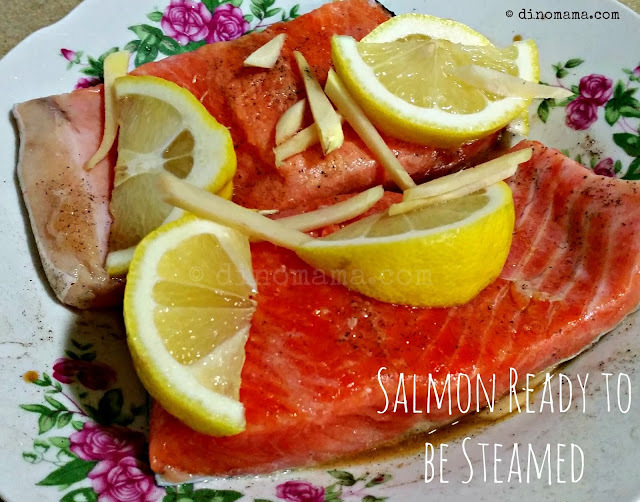 Steam the salmon fillets for 8 to 10 minutes. 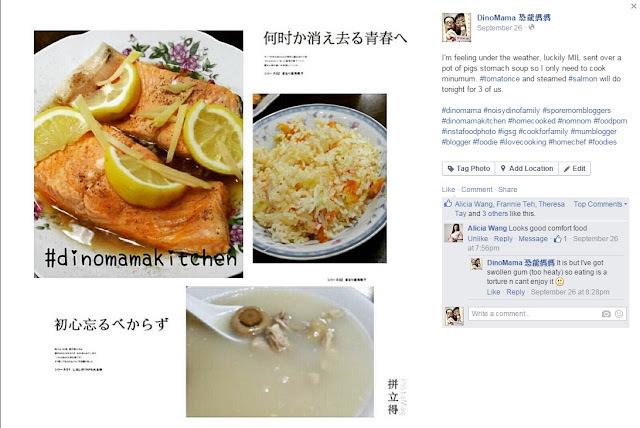 Check if the fish is cooked thoroughly by poking the thickest part of the fillet with a chopstick or fork. The fish should flake, if not, steam 1 to 2 minutes or until the fish just flakes. 7. Carefully remove the bowl from the wok. 8. Drizzle the sesame oil over the fillets. I do this slight diff, steam salmon is one of my favour that I can prepare very very very quickly after an exhausted day of working. Regardless the method they are taste delicious.